The 2018 race season is officially underway for me, and I started it off in a big way this past week! I got hired to race for Latus Motors Racing/ Latus Motors Harley-Davidson in the 2018 RSD Super Hooligan series, and I signed with Fox Racing for all my gear needs! Those two deals were really huge for me. My first set of motocross gear was Fox when I was 4 years old, and it was a dream come true to officially be picked up by that company. As far as Latus Motors Racing goes, that's a team I've wanted to race for since 2012. They've been involved in pro road racing and flat track for well over a decade, and now they are taking me racing in Super Hooligans. They run one of the most professional efforts I've seen, and its amazing opportunity to be racing for them now. 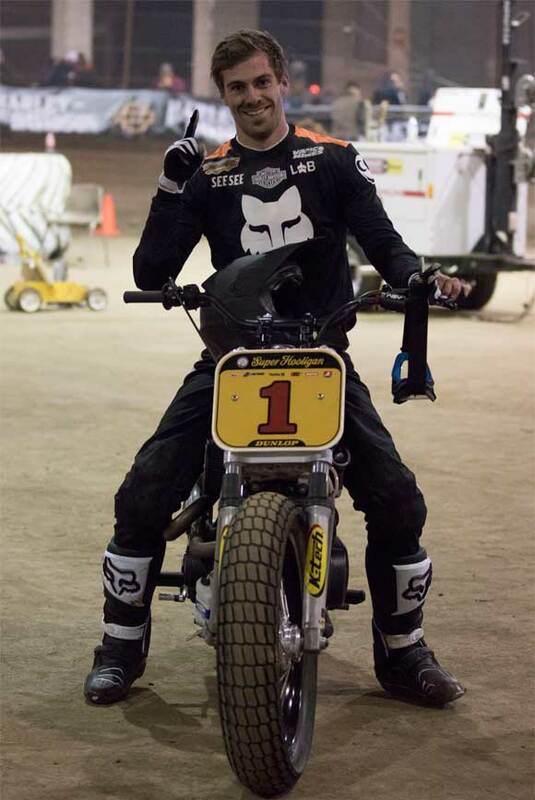 The 2018 Roland Sands Design Super Hooligan National Championship kicked off in Salem, Oregon, last week on Saturday the 10th. The race was part of The One Pro race, which is put on by The One Motorcycle Show. 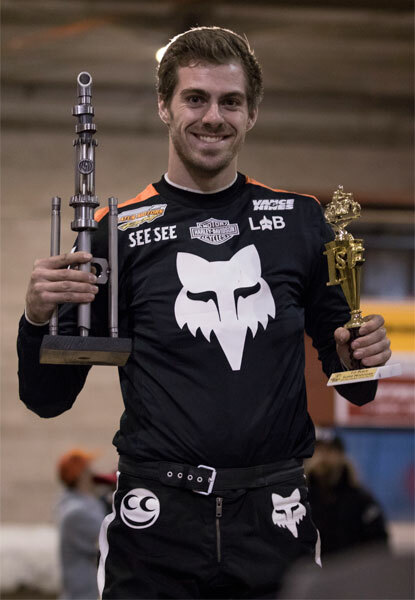 Over a thousand people were packed around the small indoor flat track, and hundreds of racers from all over the country showed up to participate. There were over 35 Hooligan racers alone. I felt amazing as soon as I hit the track in practice. Once racing was underway, I won my heat race by a convincing margin, gaining some confidence and a spot in the $1000 winner-take-all Dunlop Tires Dash for Cash. I went on to win that too over last year's series rivals, Joe Kopp, Brad Spencer and Jordan Baber. I was really feeling good now. I was going fast, and I was doing it at my home track in front of a huge local crowd. The vibe was incredible. When the main event started, I had a mission and it was to get the holeshot and get the win. I did both, but it wasn't that easy. The track conditions had gotten pretty treacherous, making it very easy to make a mistake. Wrestling these 400 pound plus machine around the track is hard enough, and on top of that, we ran a 20 lap main as opposed to the usual 12. But I rode smooth and consistent, and took home the win and the money! I made a total of $2,800 in winnings that night! I couldn't have been happier with the night. To get the win at the first round of the series at my home track was incredible. It was a goal of mine, and almost expected at this point for me. I had a ton of people there to support me from Harley-Davidson and Latus Motors Racing. Not to mention a lot of friends, supporters and my parents. It was a special night for sure. And a perfect way to start the season. We have a 2 month break now until round 2 in Perris, California. Between now and then, Latus Motors Racing is building me a brand new Hooligan race bike, using a Harley-Davidson Street Rod 750. It will be very similar to what I raced this past weekend and all last year, but a little bit better and more fine –tuned to myself. I will be announcing my other racing plans sometime this month. I have to schedule out some things, but I will definitely be doing some road racing and other stuff like I did last year! 2018 has the makings of another incredible year. My short film, "Two Wheels – One Love"